The director of a UK project to develop a car capable of reaching 1,000mph (1,610km/h) has marked 60 years since a fatal water speed record bid. London-based John Cobb had already set the land speed record when he attempted to gain the fastest speed on water on Loch Ness on 29 September 1952. After travelling at 206mph (331.5km/h) his boat broke up and he was killed. 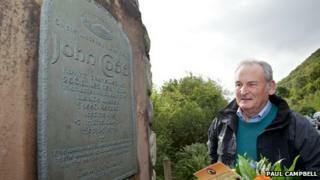 Richard Noble, director of the Bloodhound project, laid a wreath at Mr Cobb's memorial at the loch on Sunday. The project's Bloodhound SuperSonic Car (SSC) will be powered by a rocket bolted to a Typhoon fighter jet engine. The first UK test firing of the rocket has been planned for Wednesday. The wreckage of the Crusader, the jet-propelled boat Mr Cobb used in his fatal water attempt, was found at the bottom of Loch Ness in 2002. He was aiming to beat the water speed record of 178.4mph (287.1km/h) held by the American Stanley Sayres. On his first run Mr Cobb, a London fur broker, recorded 206mph, the first man to travel at such a speed on water. The craft broke up and sank, catapulting Mr Cobb into the loch. Mr Cobb's body was recovered after the crash, but for 50 years the wreckage of the Crusader has lain undiscovered 200m (656ft) down in the depths of Loch Ness.